Click on the to see history of the piece. I wrote this piece in a single day. It took me weeks to correctly notate it with Finale and make the notation accessible. Initially, my intention was to rock out. So I tried to do just that with non-tonal harmonies, a fast pace and accelerated rhythms. This is a metaphor. Imagine a dew drop, with the utmost humility and kindness daring to play around with the sun the very thing or power that is going to destroy it. 4 "Ich Habe Bambus Geschnitten" All rights reserved by S. Fischer Verlag GmbH, 60596 Frankfurt/Main 4' 06" Scored for flute, piano, viola, soprano solo & percussion (bowed cymbals- tubular bells- triangle & water gong). "Ich habe Bambus Geschnitten" published in DIE NIEMANDSROSE by the author Paul Celan, Copyright S. Fischer Verlag 1963. This is my first attempt at art song per se. The setting of the text is stylistically adventurous for me and my tastes. I liked the results though. This piece along with my piece "And Yet There Could Be Love" represent my very first attempts at composition way back when. 6 In Expression 11' 40" Javanese gamelan orchestra, 2 flutes, 3 part Women's choir (s.s.a.) Texts based on the book "The Impersonal Life"
I've always been interested in Gamelan music especially American Gamelan music. I felt that traditional Gamelan music could co-exist well with a Western style chorus. And, two flutes would just add to the pleasure of the timbrel mix. I wrote the texts. My three movement piano trio is my "Ode to Joy." The first movement is what came from me after being out of music for ten years. The second and third movements were written over a handful of years. I wrote this piece for my Master's thesis back in graduate school. The first movement looks back to Ravel's string quartet. (Assez vif: Tr?s rhythm?) The second movement looks back to Brahms & again to Ravel. The third movement harkens back to Bartok. Imagine a sunflower tracking the sun across the sky. During the night the sunflower moves itself back and awaits the coming of the sun. On the outside this seems austere. But on the inside this love rocks. Just a metaphor. Based on texts by Charles Cameron. I am a nightingale of the secret sky. I have watched many swans float by on the soft waves of the hidden river. I fly from one garden to the next. A rose is my mosque and my text is the grace of the marvelous giver. This piece was one of my first attempts at composition back in 1978. The texts are by an anonymous Vietnamese poet. I always loved to watch Harpo Marx play the harp. This piece was my first attempt at writing for the harp. It was also my first composition written under the guidance of Janice Giteck. I wrote the texts. The Mariposo Tulip is a wildflower which grows in the foothills of the Western United States. It was written for a class in gamelan music at the University of Oregon School of Music. My first piano sonata. I loved writing it. My intention was to write a technically challenging piece for solo piano. I wrote this piece directly after returning home from a family reunion in Northern Idaho in 1997. The music just came gushing out of me. This piece started out with the title: El alma en mi Coraz?n (The soul in my Heart) It was a much longer piece. First sketched out during graduate school I finalized it a couple years after I graduated from school. The music reminded me of my own wanderings. I really like this piece. The third movement especially. My friend thought I should make the phrases overlap or dovetail like Debussy did sometimes. This music personifies the inherently sweet side of my wife. This piece is suppose to be all about how everyone is always in a state of becoming closer and ever closer to God. The 2nd piece I ever wrote, from my undergraduate days at Cornish Institute in Seattle. I was 23 or 24 years old. Very sweet. Very lyrical music. Tonal/modal. The vocal range dips down to a "d" and up to a "g#". In a sopranos low to mid-high range. A Magnificat in the style of J.S. Bach Lots of Baroque style counterpoint. Written while I was still in graduate school. This piece was intended to be in a quasi serialist style. Maybe even a little surreal. An ambitious piece of mine. My thinking was to write a big piece with lots of percussion and solo flute. Never been performed. I remember it was essentially influenced by the album "Close To The Edge" by Yes. The piece is about the gift of life. Lots of chromaticism and some lyricism. This was the first time I used augmented sonorities. Writing this piece was fun. Very experimental piano music for me. My goal was to broaden my harmonic horizons. Which I did. Oftentimes very chromatic. The middle movement was my homage to Maurice Ravel's Prelude from his "Le Tombeau de Couperin" I so love this piece. This piece was written shortly after 9/11 I just found out that one of my favorite composers Tomas Luis de Victoria chose the same texts for his Marian antiphons. Another attempt at writing short piano pieces. I think that my second book of preludes is much more mature music than the first book of piano preludes. This quartet has been a bit of a bugger. It is one of my more adventurous projects. A really big choral piece over an hour at least in length. Epic. It took me a year to compose. I like to do things twice. This time the mass is very short with light small forces to accompany the chorus. I like to use world instruments sometimes combining them with traditional Western instruments. This piece is meant as just a little fancy. One of my favorite pieces I've ever done. Large forces. Never been performed. To expensive. Lots of beauty. A one of a kind piece. There is nothing like it out there in the repertoire. A spectacle. A barn burner. A piece written entirely for the pleasure of the audience. Again one of my favorite pieces that I have ever done. Written solely as an exercise in motivic development. It took me months and months to compose. Again, written in homage to one of my favorite composers Maurice Ravel. I think "Jeau Deux" had most of my attention and memory. A complete departure for me considering the orchestration, but it works. I have always wanted to write for the harpsichord. Five very different little pieces. Harmonically eclectic. Stylistically both modern and lyrical.Not to technically demanding. I wrote this piece in a single day. I don't know what came over me. I use a metrical canon meaning the dux is in one meter and the comes is in another. These three preludes are transcribed verbatim from my five preludes op. 41. I just saw these originals in the guise of the clarinet. From my early days when I would write predominately for Javanese Gamelan orchestra. I felt inspired to write music about my master Maharaji or Prem Rawat. A mammoth percussion piece. Each piece is a universe unto itself. I intended this piece as an exploration of mine into the very interesting world of percussion. This is a very special and unique composition inspired by the beautiful text by a wonderful poet Carol Vanhoff. The music is sweet and colorful. I actually made a concert band piece. Oh goody! What fun. It is transcribed from my Octet "Wildflowers" op.1. I always wanted to make a concert band version of this piece. It took me six months to make this piece. With this piece I harken back to my stylistic roots of composition. Meaning very lyrical easy to digest not complicated. But, this time I come home more mature. This music is a transcription of my 2nd mvt. of my 4th string quartet. I re-envisioned the material for orchestral size strings with solo woodwinds, brass and harps. I think it sounds much more rich more full. I originally included this piece of music as the title track to my 2nd cd which was also called "In a Wild Garden" I later dropped this track from my cd because a "new age" piece with a cd of contemporary classical music is just not right. This piece is a transcription of the original Madrigal, the final movement, of my suite for violin & viola. This piece, originally the last movement for my suite for violin & viola, is once again presented to the public in yet a new guise. This time however the viola part is now the for cello. More practical I think. It's been twelve years since my second piano sonata. I really like writing piano sonatas. It's invigorating. The harmonic language is a bit modernist. It took me six months to complete this work. A work in three movements. Again, I am revisiting the sonata allegro form. It's always been a good thing for me. This piano sonata took me nine months to complete. I don't particularly like spending so much time on a piece but a have to get it right. Modernist harmonic language. Influenced by John Luther Adam's "Become Ocean" I wanted to write a drone piece and keep the instrumentation affordable. In two parts the first rather somber and the 2nd part more happy. I have always been a big fan of Mozart's flute quartets. A lovely combination. I couldn't resist the chance to write a piece for flute quartet.This piece has allot of fifth species counterpoint. Five short miniatures. I have always admired Debussy's "Syrinx" for solo flute. I loved the seamless pitch inflection and, the easy dreaminess. Just a little percussion ditty. The title refers to instruments of indefinite pitch and instruments of definite pitch. The clarinet has such a sweet timbre.Here, as the title suggests I'm just trying to be a little fanciful. Melodies for sure. Characterized by the long and the expeditious in both the clarion and chalumeau registers. It's been five years since i last worked on a string quartet and I must t say that it feels very good to be back home again writing another string quartet. I heard a great string quartet by Fanny Mendelssohn and it definitely influenced me. I transcribed my Five Miniatures for flute quartet to a quartet of clarinets. I know that writing for the violin can be versatile and packed with virtuosity. I'm just trying to keep things simple which is the most challenging. I transcribed the third mvt. of my 5th string quartet to make this piece. For years now I've wanted to write a 5th and 6th string quartets Done deal. Now it's time to move on. I love the lyrical potential of the oboe. Music for the oboe can be very sweet. I've always been fascinated by the harp. I'm a big Harpo Marx fan. A piece for cello utilizing allot of multiple stops. A friend listened to the music. it reminded him of monarch butterflies flitting about chasing after nectar. I love writing for clarinet and bass clarinet. The clarion and chalumeau registers are so beautiful. The double bass is an interesting instrument. Large mass. long thick strings. A short bow. I always loved it in rock-n-roll and Jazz. 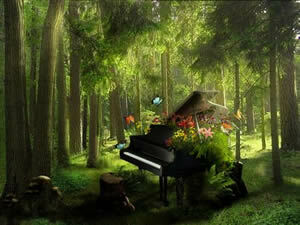 But this piece is purely contemporary classical in nature. I started this string quartet in July of 2016 and finished it on October 1st 2016. It's my only four movement string quartet. My quartets are usually three movements. I love to work with woodwinds. The various colors and timbres that can be created through different combinations is remarkable. I love woodwind music at fast lively tempos. Harp and violin is such a good combination. I couldn't resist the chance to write something for this combination. I don't know if I've ever seen this combination of instruments. In any case, two harps are better than one. As always, here I try to write the most beautiful music that I can. This piece is a re-tooling of my Passacaglia I wrote back in 2006-2007. I just re-orchestrated it for chamber orchestra. It is a set of 25 variations over a re-occuring harmonic and melodic theme, a basso ostinato. This song cycle consists of 16 art song. 16 poems by Carol Vanhoff. Strictly"Old School" traditionalist music I think. I've always wanted to write a song cycle. Just never got around to it. This piece is meant to be improvisatory. It begins with a theme and its subsequent development is solely dependent upon the whim of the composer. This piece is one of a handful of mixed wind ensemble pieces I've written recently. However, this time I've added a marimba. I thought the mixed wind timbres would blend well with a marimba. Woodwinds and marimba timbres works so well together. This piece is yet another collection of original tunes, set like a medley of tunes, written solely for a large ensemble of woodwinds and winds. I've always wanted to write a percussion piece which included two dueling snare drums. I once heard a piece performed at Cornish which was scored for 2 snare drums only and it was amazing. It left quite a lasting impression on me. I am enjoying writing music using exotic pitch collections. A collection of 12 misfit musical narratives based on an appreciation for family minutia and some common household practicalities"
I can't help but to strive to write harp music like Debussy and Ravel because it keeps me clean and humble, I hope. I grew up loving Debussy's "Sacred and Profane Danses" for harp and string orchestra and Ravel's "Introduction and Allegro." This piece is more or less in a minimalist style. Things are always changing though. It is a very developmental piece.